The key to a comprehensive peace in Sudan hinges upon Abyei, the volatile and oil rich area astride the boundary between North and South Sudan. Historically unique, Abyei developed a reputation as a bridge between North and South Sudan, but eventually as Southern nationalism grew during the first North-South War, the identity of the Ngok Dinka of Abyei as Southerners surged. That war ended with an agreement in which Abyei won a referendum which promised its population the choice to remain in Kordofan or be integrated into South Sudan. True to course, Khartoum failed to implement this referendum. During the second North-South war, lasting twenty years, the Ngok Dinka were scattered and Abyei uninhabited. The U.S. helped the Government of Sudan and the SPLM broker the peace agreement reached in 2005, but the two parties could not come to an agreement on Abyei. Determined not to let the talks unravel, the U.S. drafted the text of an Abyei agreement, called the “Abyei Protocol,” which both parties signed, but Sudanese President Bashir has rejected it. Today, Abyei remains tense. 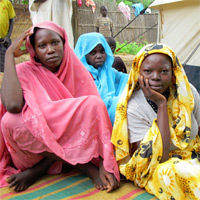 The displaced population has begun to return, but life is very basic and peace fragile. Abyei Boundaries Commission (ABC)—The commission—made up of five representatives of each party (Government of Sudan and SPLM) and five international experts—commissioned to reach an agreement on Abyei that would be final and binding; despite this agreement, it was summarily rejected by Sudan’s President Bashir. Comprehensive Peace Agreement (CPA)—The agreement signed in January 2005 that ended the twenty-year-long war between North and South Sudan; the CPA is slowly deteriorating as the Government of Sudan continues to fail to implement elements, such as its commitment on Abyei. Government of National Unity—The government made up of representatives from South Sudan and the NCP, created by the CPA. National Congress Party (NCP)—The ruling national party of Sudan has failed to implement its commitment on Abyei and other elements of the CPA. This is part of a pattern of obstruction that is at the core of its strategy, closely linked to its obstruction of the UN-AU Darfur force. its participation in the GNU, but announced in December, 2007 that it would return, suggesting an agreement had been reached on all the CPA issues except those provisions related to Abyei. United States—The U.S. played a critical role in brokering the CPA, but has been largely missing in action in terms of facilitating and pushing for faithful implementation of the Abyei Protocol. Abyei’s boundaries, a share of oil revenues to meet the needs of Abyei survivors and returnees, a security arrangement, and a referendum in 2011 to determine Abyei’s final status: in the North or in the South. The NCP’s failure to implement the Abyei protocols has dangerous repercussions for the South, Darfur and all of Sudan. Its rejection of the ABC report, and the international community’s silence, has set the precedent that one party to the CPA can abrogate the CPA provisions without penalty. This could hold serious implications for the 2009 elections, the referendum in 2011, and it raises the threat of violence and a return to full-scale war. Furthermore, the Darfur rebel groups severely question why they should enter into negotiations with the ruling party, whose track record of abiding by negotiated settlements has been thoroughly negative. The non-resolution of Abyei and the lack of interest demonstrated by the key international partners—especially the U.S.—means that the threat of Abyei unraveling remains a dagger pointed at the hopes of peace in Sudan. The U.S. helped lead the negotiations that produced the CPA, and in particular the Abyei portion of the agreement. The U.S. must lead multilateral diplomatic efforts to break the impasse over Abyei which threatens the CPA, and more widely a potential peace for Darfur. Building a diplomatic team—Ambassador Rich Williamson, the newly appointed Presidential Envoy for Sudan, needs two full-time deputies, one focusing on the CPA and the other on Darfur, as well as a small team of diplomats based in the field. Imposing a cost—The U.S. should work within the UN Security Council to press for targeted sanctions on anyone obstructing implementation of the CPA or the deployment of the UN-AU hybrid force. The U.S. must also work with the European Union to coordinate pressures and provide intelligence to the International Criminal Court. Creating a field presence—The U.S. needs to have a regular and visible presence in Abyei for both political and programmatic reasons. Preparing for national elections—The U.S. must use sticks and carrots to press for free and fair elections in Abyei in 2009 and in the referendum scheduled for 2011.